Mom's and Kids Hamantashen Bake! On Sunday evening, close to 200 moms, (dads) and kids joined to make Hamantaschen in preparation for the holiday of Purim! Photo Gallery on Website and Facebook! 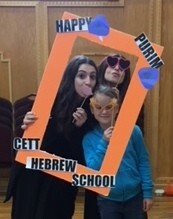 Getting in the Purim spirit, Hebrew school children enjoyed Purim activities, learning the mitzvot of Purim, acting out the Purim story, and lessons they can apply to their own lives from this fun holiday! Purim prep is in the air at Hebrew school! Children are studying the history and meaning of this favorite holiday with stories, hebrew reading, drama, puppet making, songs, fun sheets and text based megillah reading. Photo gallery on Website and Facebook. It's February and Purim fun is on the way! Turn the calendar page and check out the exciting events we have coming up this month! Thank you to our February calendar sponsors: Michael Gutnikov, CPA, Gary I. Gorodokin, M.D., Julia Starobinets, DDS of Bright Smiles Orthodontics, Zohar "Zack" Zamir of The ZAMIR GROUP, and Modway Aveline Mattress.